1To make the quince syrup: Cut the quince to small chunks. Place them with the seeds in a sauté pan cover with water. Once boiled lower the heat and simmer for 30 min. Once quince pieces are completely cooked and soft get all the juice from the quince using potato ricer. Transfer the juice back to the sauté pan add the 1-1/2 cup sugar and simmer for one hour until liquid gets syrupy. 3Preheat oven to 375 degrees F.
4Wash the duck with cold water. Pat dry. Lightly season inside and out with salt. Place the duck, breast-side up in a roasting pan and brush it half of the quince syrup. Transfer the pan to oven. After 20 minutes, lower the heat to 350 F and add 1 ½ cups water mixed with the rest of quince syrup. Roast for 1 1/2 hours scooping the syrup over the duck every 10 min. If you are cooking Pekin duck you will need to roast it for longer to get all the fat out. Muscovy Duck is up to 40% less fat than Pekin duck. 5Increase the oven heat to 450F and continue roasting the duck for about 5 minutes. Then turn and roast for 5 to10 more minutes until duck skin gets crispy on the outside and succulent on the inside. 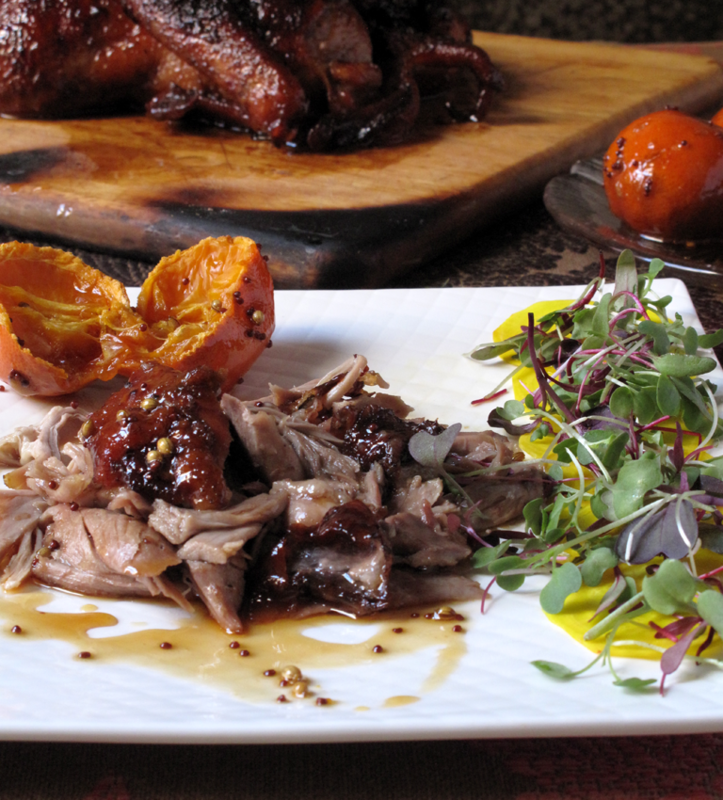 6Served with Tangerines soaked in Honey and Exotic Spices and micro greens salad.